You have a right to believe God for anything He has promised in His Word. The Word says in Psalm 127:3, “Lo, children are an heritage of the Lord and the fruit of the womb is his reward.”Psalm 84:11 says, “…no good thing will he withhold from them that walk uprightly.” Also, Psalm 113:9 says, “He maketh the barren woman to keep house, and to be a joyful mother of children.” Exodus 23:26 in The Amplified Bible states, “None shall lose her young by miscarriage or be barren in your land….” Besides focusing on these scriptures, remember also that God is no respecter of persons (Acts 10:34). What He did for Hannah in 1 Samuel 1, He’ll do for you. These are truths that John and Marty Copeland learned to apply when believing for the conception of their first child. 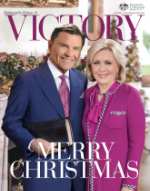 Their daughter Courtney Mercer Copeland became the seventh grandchild of Kenneth and Gloria Copeland because of the walk of faith in her parents’ lives. They learned to sow seeds for the specific things they were believing for. Marty gave a baby shower to honor and bless a friend. She made the conscious decision to sow love into the lives of the children around her. Every time they prayed over their food, John would say aloud, “Father, I thank You that Marty’s pregnant. We have a perfect child.” At a time when her faith was beginning to waver and she needed a breakthrough, God revealed to Marty that she wasn’t “missing it.” Rather, she just needed to seek Him more by pressing in with her faith in every area possible. Search for additional scriptures and look for new areas to apply your faith. God will meet you where you are with the encouragement you need to receive your manifestation. Children are the right of a marriage covenant with God (Deuteronomy 28:11). Based on the Word of God, we set ourselves in agreement with you that you have the desire of your heart, a child of your own. The Lord perfects that which concerns you (Psalm 138:8). God’s Word is always His will. We have included a prayer and scriptures that we believe will minister to you as you stand on them. As you make these scriptures part of your prayer life, you may be sure that you are praying according to the will of God. “And this is the confidence that we have in him, that, if we ask any thing according to his will, he heareth us: And if we know that he hear us, whatsoever we ask, we know that we have the petitions that we desired of him” (1 John 5:14-15). We believe with you! Father, as Your children, we come to You and remind You that we have been redeemed from the curse of the law and You have promised us all the blessings of Abraham. We are in a covenant with You and we expect You to fulfill the conditions of that covenant. Father, we desire to have a baby, and since Your Word says that children are a gift from You, we expect to have a normal, healthy baby. Since __________ has been redeemed from the curse, we expect her to carry that child full term. Your Word says You will bless the fruit of her womb, and Your Word says she will lose none of her young by miscarriage or be barren and that You will keep her safe through childbearing. Since she is no longer under the curse, she will be able to have this child the way You originally planned for Eve to have children—free from pain and suffering and pangs and spasms of distress. So we expect this child to be brought into the world quickly and with no pain. We believe she will feel the contractions but will feel no pain. We believe, according to Your Word, that she will have a beautiful pregnancy with no suffering during it. Thank You, Father, for hearing and answering our prayers and for faithfully watching over Your Word to perform it. We know You have given Your angels charge over us to accompany and defend and preserve us in all our ways. Now, Satan, you hear the Word of God. We speak it to you and command you to take your hands off us, God’s children, in the Name of Jesus. We break all assignments you have put up against us and forbid you to hinder this pregnancy or childbirth in any way. We bind you, and the Word of God declares that whatever we bind on this earth is bound in heaven, and whatever we loose is loosed in heaven. And we loose the peace of God to flood our hearts right now, in Jesus’ Name. Thank You, Lord, for hearing and answering our prayers. We love You and we appreciate You and look forward to seeing this precious little love that You have especially picked out for us.